The best video i've watched for one-arm pull-ups! 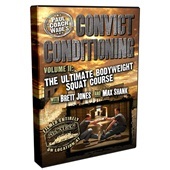 Paul Wade’s Convict Conditioning Volume 5, Maximum Strength: The One-Arm Pullup Series explodes out of the cellblock to teach you in absolute detail how to progress from the relative ease of a Vertical Pull—to the stunning, “1-in-1,000” achievement of the One-Arm Pull-Up. Ten progressive steps guide you to inevitable mastery of this ultimate exercise for the upper back, steely, bulging biceps and etched abs. 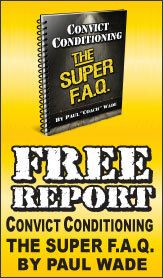 How sure are we that Convict Conditioning, Volume 5: Maximum Strength: The One-Arm Pullup Series (DVD) will work for you? 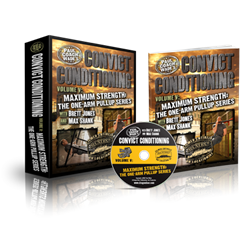 Simply fill out the form below and put Convict Conditioning, Volume 5: Maximum Strength: The One-Arm Pullup Series (DVD) to work for you right now. Obviously, we would go out of business if Convict Conditioning, Volume 5: Maximum Strength: The One-Arm Pullup Series (DVD) didn't work, the way we said, right? 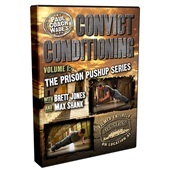 With the promise of a full refund if you're unsatisfied, you have nothing to lose by trying Convict Conditioning, Volume 5: Maximum Strength: The One-Arm Pullup Series (DVD). Go ahead and try it today. Filmed entirely—and so appropriately—on "The Rock", Wade’s Convict Conditioning Volume 5, Maximum Strength: The One-Arm Pullup Series explodes out of the cellblock to teach you in absolute detail how to progress from the relative ease of a Vertical Pull—to the stunning, "1-in-1,000" achievement of the One-Arm Pullup. Ten progressive steps guide you to inevitable mastery of this ultimate exercise for supreme upper body survival strength. Prowl through the heavily and gorgeously-illustrated 88-plus-page manual and devour the entire film script at your animal leisure. Digest the brilliant, precise photographs and reinforce the raw benefits you absorbed from the DVD. Paul Wade adds a bonus Ten Commandments for Perfect Pullups—which is worth the price of admission alone. And there’s the additional bonus of 4 major Variant drills to add explosivity, fun and super-strength to your core practice. Whatever you are looking for from your pullups—be it agile survival strength, arms of steel, a massive upper back with flaring lats, Popeye Biceps or gape-inducing abs—it’s yours for the progressive taking with Convict Conditioning Volume 5, Maximum Strength: The One-Arm Pullup Series. Number one: Pullups are the number-one upper back builder. This is hard to dispute. As well as working virtually all the upper back muscles, pullups really effectively target the latissimus dorsi, the "lats", the biggest muscles of the upper back. Our distant ancestors evolved pulling their own weight up through the trees, and that anatomical heritage is still there, lying dormant in all our bodies. Pullups harness this genetic advantage in the quickest possible way. Some guys get big lats almost overnight from this exercise! Number two: Pullups are functional. This is an important part of prison training. It teaches you to move. Pullups are a training in self-movement. A fat, out-of-shape bodybuilder might be able to deadlift five-hundred pounds, but can he get up and over a high wall? A strong, agile pullup-trained athlete can do this in half a second. Number three: Pullups are the best biceps builder in the world. Look at the guns on a gymnast if you don’t believe me. Curls only work the biceps through one joint, the elbow joint, and this limits their power. Pullups work the biceps through both joints, the shoulder and the elbow. This makes them the most effective technique possible. Number four: Pullups are very safe. Most acute injuries in the gym occur to the spine and particularly the lower back area. A lot of these come from back training, and bending over while holding weights—deadlifts, rows and cleans can cause a lot of injuries this way. But because your feet are off the ground during harder pullups, there’s minimal force going through your spine. Your chances of a lower back injury during pullups are virtually zilch. If you want more information on pullup theory and anatomy, refer to the Convict Conditioning book, chapter seven. So if the pullup is so great, why is it that so many trainees are skipping this movement in their routine? Well, there are two reasons. First, a lot of guys—either heavy people or beginners—look at classic pullups and think they’re just too tough. These people may not yet be able to pull their own bodyweight. So they get intimidated by this exercise. Coming from the opposite angle, many advanced athletes see the pullup as too easy; they might be able to easily pull their weight with two hands, and turn to barbell exercises to provide more weight. Both these attitudes show a lack of understanding of progressive calisthenics. When these trainees think of a "pullups", they picture the regular two-handed full pullup. In reality, there is more than just one type of pullup. The "pullup" isn’t just an exercise, it’s a whole family of movements. Some of these movements are real easy, and could be done by almost anybody, even total beginners. Some of them are incredibly hard—much harder than the regular pullup—and can only be performed by a handful of the strongest men on the planet. This is where Convict Conditioning comes in. The Convict Conditioning system takes ten of the best pullup-type movements, and puts these techniques in order of difficulty. You start the system at the bottom, with a real easy exercise. Once you master that technique, you move to the next exercise, which is just a little harder, and so on. These exercises have been broken up into a set of stages, which is sometimes called the "ten steps". This is a key feature of the Convict Conditioning system. Without following some kind of structured, progressive approach, it would be impossible for even the most naturally powerful athlete to achieve incredible feats like assisted pullups and one-arm pullups. Like all big achievements, you need to break these seemingly impossible stunts into chunks. But don’t get led astray by the idea of the "ten steps". Each exercise, each "step" is just a stage. There are actually many more than just ten pullup exercises in the system, and you can use as many as you need to progress. For example, in one step you do pullups with your hands about shoulder-width apart. On the next step, to make things harder, you bring your hands close, right next to each other. These form two steps in the series, but in reality if you wanted you could bring your hands in an inch each time you train—so you’ve turned two exercises, two hand positions, into more than a dozen. Likewise, on assisted pullups you help yourself up by pulling on a towel—but how and where you grip the towel makes a big difference to the difficulty. So, if you’re smart, one exercise can become several exercises, by applying a subtle change. After we show you each exercise, we’ll give you an idea of how to discover these "hidden steps". There’s a whole lifetime of great training and exercises on this DVD! Rated 10/10 The best video i've watched for one-arm pull-ups! Fantastic and helpful step by step progressions towards one of the most impressive feat of strength exercises! The hints at the beginning were very good and mention a few things they don't have in the book. So its well worth a watch even for those who have already read the book. Everything that has been released in the CC series is a 10. I have been a Personal Trainer for few years now and I can truly say its all a 10. This DVD is a treasure chest of the best info out there on how to accomplish the one arm chin! Get this DVD!